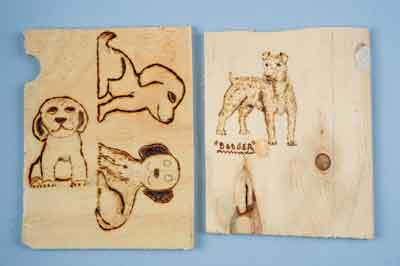 The inspiration for this latest project came about by chance when I was showing some of my class at Bognor College a few pyrographed sketches on plywood of some of my dogs - we have six at the moment! I find it quite good with some breeds to carve them 'in the round' as well as making just the head and shoulders to use as walking stick handles. 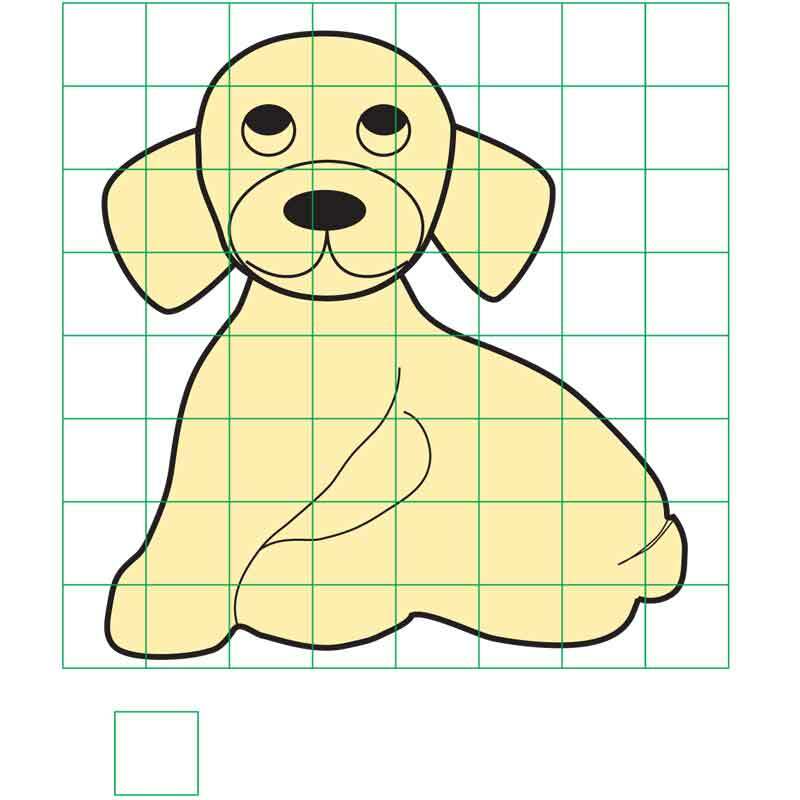 One of my students asked if I could do a puppy... well, a puppy is just a little dog, I thought, so after some discussion we decided to carve this little sweetie with big eyes and a smiley face. You can finish it however you like, with oil/varnish, colour or pyrography. The first step in this project, after settling on this simple design, was to scale the chosen sketch and transfer it onto a piece of alder (Alnus glutinosa) measuring 100 x 75 x 50mm that I had left over from a previous job. You can of course scale the project to whatever size suits you. 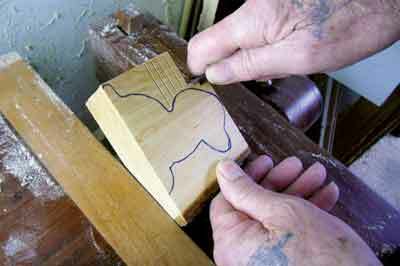 Transfer the design of both the side and front views onto your chosen piece of timber. 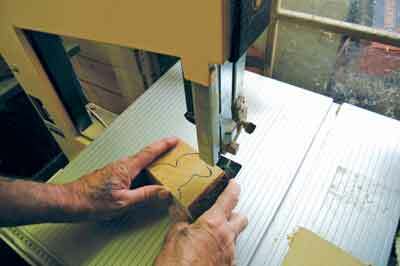 You can then remove the surplus, using a bandsaw or fretsaw. 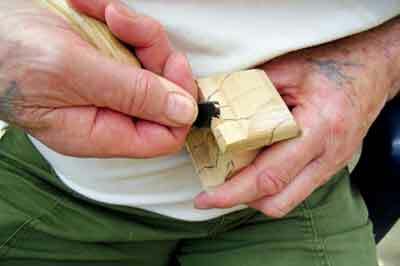 Take special care with your fingers here, as the block is small. 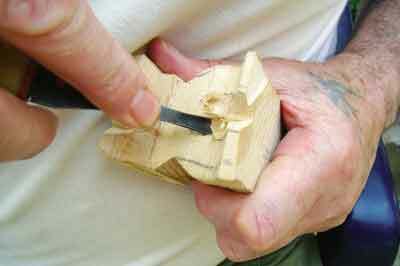 If you prefer, you can do the whole thing using only hand tools, depending on what you have available. 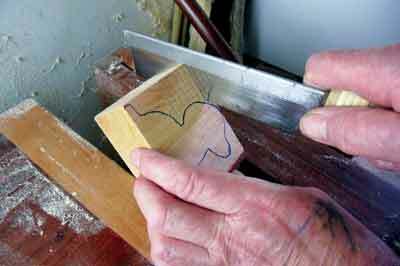 First, make a series of cuts with a handsaw down to the outline of the drawing, making sure the cut finishes level on both sides. 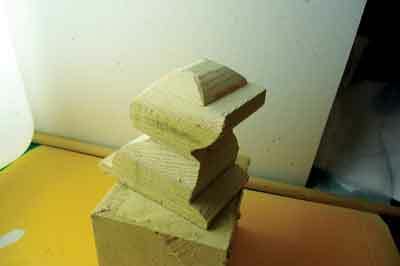 Then simply cut away the waste sections with a chisel or knife. When doing this, make sure the workpiece is clamped firmly, and, for safety reasons, do not cut towards your other hand. 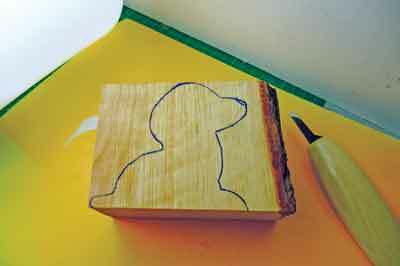 Whichever method you choose, you should end up with a cut out blank that looks something like this. At this point, you can decide whether your puppy's head will face forward or to the right or left. The plan view shows how it might look. 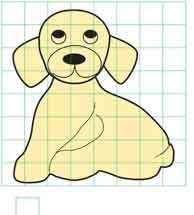 Draw a centreline from the nose to the tail to establish the position of these features. 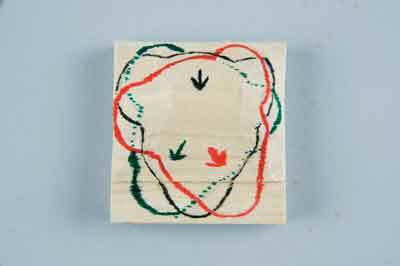 With your centre line drawn, you can now mark the positions of the legs and ears. This will vary depending on the angle of the head. 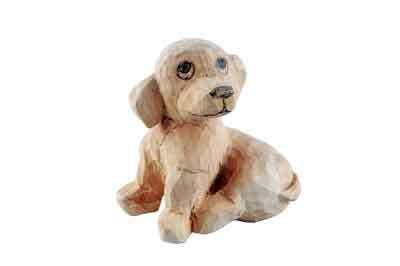 Start by removing the wood from the nose and tail, before moving to the shaping of the ears and legs using carving knives and a skew chisel. 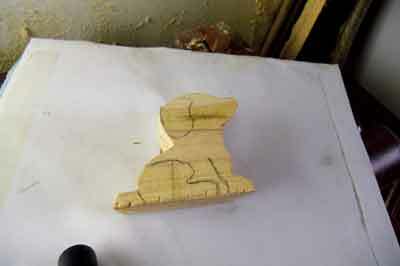 Next, I used a 6mm, No.8 palm gouge to remove the wood from between the puppy's front legs. 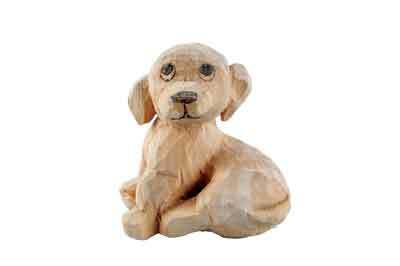 You can then shape the head to get that nice rounded puppy look, using a range of rifflers or abrasives of your choice. 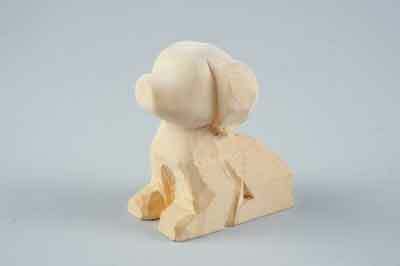 It is very important that you get the basic shape of the head looking as puppy-like as possible, as with a stylised piece like this the rest of the sculpture happens around it. Here's one of my finished puppies. You'll notice that for this one I chose to have the dog's head facing to the left, rather than to the right or facing forward. 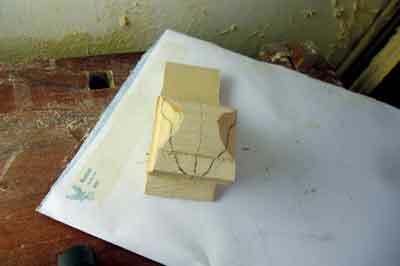 It's up to you whether you draw, paint or pyrograph in the details; as is the choice of finishing. I hope you have fun making this project.